USA esports fans have it harder than their friends around the world when it comes to finding decent esports betting sites, let alone great free bet offers and other match deposit bonuses. It’s mostly due to the complex state-by-state sports betting laws that differ greatly from one another, but thankfully there are some highly-rated online sportsbooks with great esports betting markets and even better promotions to take advantage of and maximise your wagering experience. This page will list the best and safest esports sportsbooks for US customers, which are licensed and legally able to cater to American esports fans looking to place a bet or two on their favourite matches and tournaments. The team at EsportBet.com has scoured the World Wide Web for the best free bet offers and other deposit bonuses available for North American esports fans. Below, we break down the top value promotions running at USA esports betting sites, and we provide links to the full reviews and final verdict on each sportsbook for your convenience. We recommend all of our US esports readers bookmark this page for free bets bonus updates. BetOnline.ag is our top pick for North American esports fans to place bets on their favourite matches and tournaments, often opening up early betting markets and low mark-up odds for a number of games including CS:GO, Dota 2, League of Legends, Overwatch, Rocket League, StarCraft II and Vainglory and World of Tanks. BetOnline specialize in catering to the American sports bettor, so if you enjoy wagering on other traditional sporting leagues such as the MLB, NBA, NFL, NHL and more international events, you will be right at home here. There are also only two currency options available at BetOnline, Bitcoin and US Dollars, which will suit US customers best. BetOnline run a number of ongoing promotions in addition to one-off bonuses and generous match deposit offers which, when combined, can offer a savvy esports bettor some seriously great betting value to put towards your next big bet. We break-down each of their relevant bonus and free bet offers for esports fans in the section below. You can read our full BetOnline esports betting site review for more information on its customer support, licensing and payment methods. BetOnline’s Mobile Betting $50 Free Bet/Free Play: BetOnline gives all new sign-ups up to $50.00 in free bets, also called free play, on your first ever mobile sports bet – which includes esports. Just visit the BetOnline sportsbook on your mobile/smartphone/tablet device (Android and iOS supported) and place a real money bet through there. The free bet covers any potential loss you might have on your first esports wager made on mobile up to $50 maximum. If you bet $50 on a moneyline match-up and lose, BetOnline will credit your account within 48 hours with a free bet (called free play on-site) equivalent to your deposited amount. For reimbursement, just flick an e-mail to [email protected] with your account number and the ticket number of the single bet you made within 24 hours of match result and put “$50 Mobile Free Play” in the subject line of the email – BetOnline will do the rest. BetOnline’s 50% Welcome Bonus: If you sign up to BetOnline via our links, you can score a 50% welcome bonus up to $2,500. If you deposit anywhere from $25 (minimum) to $2,500 (maximum) in your first transaction at BetOnline, the site will match your deposited amount by 50% and credit your account accordingly. All you need to do to be eligible for this match deposit bonus is to enter the promo code ‘NEW2500’ at the cashier section while processing your deposit – otherwise, you forfeit your potentially fruitful esports welcome bonus. 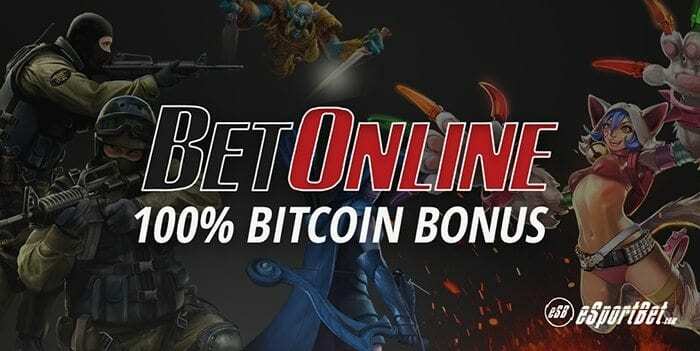 BetOnline’s 100% Bitcoin Bonus: Bitcoin lovers who also love to bet on esports will be right at home at BetOnline thanks to their extremely generous BTC match deposit bonus. On your first deposit using bitcoin cryptocurrency, BetOnline will match your deposited amount 100% up to $1,000. So if you deposit anywhere from $20 (minimum) to $1,000 (maximum), BetOnline will essentially double your account balance by matching you. If you’re a big wagerer and want to get the maximum bang for your buck for esports betting, this is probably the best bonus option available to USA esports bettors. As standard with any online sports betting or gambling, there are wagering requirements (5x roll over rate) associated with the free bets and match deposit bonus offers. All of these offers can also only be claimed once, per account, per IP address, per household – bonus abuse will result in BetOnline voiding your account and leading you to forfeit any bonus money left within. We highly recommend visiting BetOnline and reading their terms and conditions prior to signing up or claiming a bonus. You can start claiming esports free bets and bonuses at BetOnline.ag by following our links and the instructions provided within. Bovada.lv is an American-focused online sportsbook and while it has fewer esports betting markets and options than BetOnline, it carries incredible bonus value for savvy bettors who like to wager on the most popular tournaments and events such as the League of Legends Championship Series, Intel Extreme Masters and Overwatch League. Bovada supports both US Dollars and bitcoin as betting currencies, so no currency conversions are required here. Like with BetOnline, it has an extensive sportsbook section for esports fans who also like to wager on other sporting events, and it also has a fully-fledged online casino for those who like real money gambling as well – all in one convenient place. In terms of free bets, Bovada.lv has offered some in the past but presently does not have any claimable. However, they do have some match deposit bonus offers that offer seriously good value for esports fans wishing to get a sizeable bonus on top of their first few deposits prior to putting down their bets. We break-down each of their match deposit bonus promotions for esports fans in the section below. Please visit our Bovada.lv esports betting site review for more information on its customer support, licensing and payment methods. 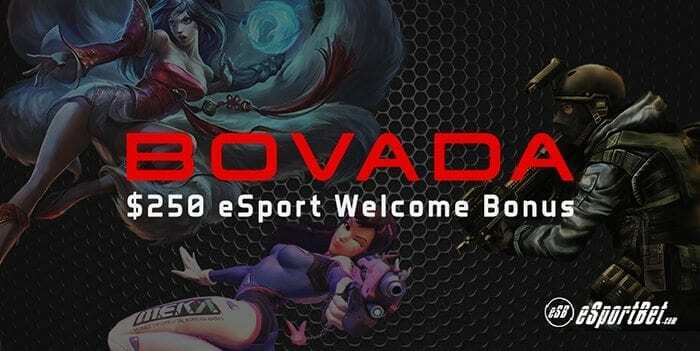 Bovada.lv esports welcome bonus: Sign up to Bovada via our provided links and you will be eligible for a 50% esports sign up bonus up to US$250, which can be used on all available esports betting markets across Bovada’s desktop and mobile site. All you have to do is make a real money deposit at least once, and Bovada will match your deposited amount within half an hour, giving you a quick and easy boost to your account balance within practically minutes of signing up. You can also use this match deposit bonus for bets on other sporting and racing betting markets, should you desire. Bovada.lv bitcoin welcome bonus: Like BetOnline, Bovada fully supports bitcoin as a betting currency. If you sign up for account at Bovada and deposit using the cryptocurrency, you can claim a match bonus of 50% up to $500 using the bonus promo code, ‘BVSBITCOIN50’ at the cashier checkout before finalising your deposit. While not as big as BetOnline, it’s still a great, simple bonus you can take advantage of at your leisure. Bovada’s bonuses carry the standard wagering requirements (5x roll over rate) associated with its match deposit bonus offers, and standard terms and conditions (only claimable once, per household, per IP address) apply. Always familiarise yourselves with the general T&Cs as well as stipulations specific to the bonus in question, by visiting the site and reading it up for yourself first before proceeding with registration. If you are ready to begin betting on esports at this site, you can start claiming your match deposit bonuses at Bovada.lv here. What are some of the esports games USA customers can bet on? North American esports fans who want to place a bet on their favourite esport will be happy to know most traditional sportsbooks, like BetOnline and Bovada, offer guaranteed betting markets on the most popular matches and tournaments. It is, however, becoming more and more common to see betting options available for niche, or smaller regional events for games that aren’t quite on the level of the big names just yet. Here are some of the esports you can wager on from the US, with full guides provided if you want to familarise yourself with the bet types and best odds.